[wp-rss-aggregator]”How to start a blog” in South Africa? I would like very much to share with you on how to do this from an online marketing perspective. We want search engines to find it after all. Please bear with me as not everyone who reads this is convinced yet as to why they want to know how to start a blog. We are going to tackle the how to’s further down the page. For now let’s discuss why you should do this. Of course, if you are very clear on why you want one, then please just skip this and read further down. If you aren’t so sure let me reassure you why you should create a blog! When done right it is a great way to earn money. Blogging is truly easy to set-up. I promise you this. Blogging rocks when you have a passion or an interest that you want to share with the world. Maybe you have noticed a niche out there. Maybe you are an authority on a topic that you want to share. Blogging really has developed into one of the most attractive tools to spread advice, knowledge, news and to communicate in general – it is a fabulous platform. Search engines love blogs and finds them quickly and easily – making your online marketing easier. You can help other people if you want to via your blog. Grow your business using your blog. Improve your search engine rankings by driving traffic and interest to your website. It is an awesome means to convey thoughts, even if you aren’t an aspiring writer. You can part all sorts of passions with others cheaply, quickly and easily; and others can find you. I found an article in my search results that lists 100 Blog Topics. 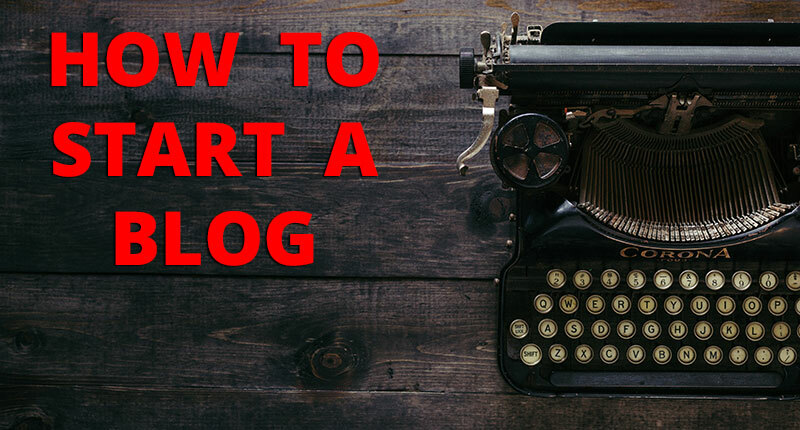 So you have no excuse when looking for ideas on how to start a blog. From an SEO perspective, the trick here is not so much the topic that you choose. It is more important to choose something that you are passionate about. Something that gets you going in the morning. Writing about something that you love is much easier to maintain than something you don’t enjoy. This is an important conversation I will have with you later down the line and it is about producing consistent, quality content. What should I name my blog? If your blog is regarding you, like an online journal, then you can use your name. If you are wanting to build a brand, then name the blog after the brand. Try and make it relatively memorable. Not too weird. Make it easy to say and type. Keep it simple. Don’t use someone else’s brand name. Think about the phrases you will use on your website and use them in your domain name. So, if your blog is about food then use something like “cooking”-something. But remember you must link them to keywords that will get you less competitive traffic later e.g. cooking for 4 vegetarians. Stay away from numbers and hyphen’s. Having said all of that, don’t stress too much about the name. Rather get going with the blog, read further on how to start a blog. It doesn’t have to be perfect, just good enough, so get cracking. Where Should I Keep My Blog? Once you have decided on what you are going to blog about and the name, you need to choose where you want to keep your blog. Your choice is either a hosted blog or a self-hosted blog. There is debate around this but as an SEO specialist, it is a no-brainer, there is only one choice. There is a debate around whether your blog should be in South Africa or not if you want to SEO it. Speak to a professional first please as this is important. A self-hosted blog is where you find a hosting company for your domain name and the contents of your blog to live. You are renting space from them to house your blog and you can move it whenever you feel like it. You have complete control and access to the backend. It is your website and domain name 100%. If you want self-hosted, then use wordpress.org. Don’t get confused with wordpress.com. Depending on your hosting company you can easily install it all online in 5 minutes. Otherwise you download it and install it. If you want more guidance on whether to choose hosted or self-hosted then read this article. They aren’t always as free as you might think. The free urls often have long complicated domain names, which makes it harder for people to remember your blog. Bloggers can make money by placing adverts on their website. There are limits on these platforms. You might not be able to do as much advertising as you want. You will be limited with the amount of media you put up. It isn’t necessarily easy to edit the theme you choose to use. You need to do this if you want to do any online marketing. Control over the backend is super important and you don’t have this on hosted platforms. You cannot just use any plugin for example. These plugins give you functionality on your website and can really help your SEO and online marketing efforts. You will not own your blog. They can shut you down any time, for any reason. They have the final say regarding your blog’s content. My advice? Self-host a wordpress.org blog with a hosting provider or hire a web designer here in Cape Town to create a custom blog for you. If you have decided to completely ignore my advice and chose a hosted platform then please read my blog hosting platform article that I will post soon. It will come with pros, cons, prices and a recommended target market. Write down why you want to begin this blog. Do you know who your target market is? Create some goals for example how many followers you want by a certain date? How often do you plan on publishing content? Always take a peek at your competitors. Your blog needs to be better. What pages and I am going to have? Decide on how you want your visitors to feel when they arrive at your blog. Then research a ‘look and feel’ for your website. Look at the themes offered. What images will I use on my blog? Where can I get these images? Start your first post. It should be a minimum of 1000 words. How are you going to promote your articles? What tools are you going to use to monitor your blog? When you have chosen your hosting options, have an idea of how you want the blog to function, its structure, it’s a good time to open an account with your selected platform or install the software. Creating an account is slightly different between the hosted platforms, don’t hesitate just go for it. If you are going for self-hosted, the process is slightly different with each hosting company. They might have instructions on their website or they might help you get the software running. Now you are ready to start writing! Congratulations now you know the very beginning stages of how to start a blog in South Africa. You have realised that you don’t have to be in South Africa. You have your blog up and you are ready to start having fun! When you compose your articles make sure you sound like an authority on the topic. Google loves that! Use photos, infographics, videos and images in your articles. Depositphoto is a fab resource. Learn about good SEO practices. Lastly, promote and market your articles like crazy. Free blogs are good for beginner to start their blog. Free blogs are all over the web like blogger, wordpress, weebly and many more. Personally, I prefer wordpress for it’s user friendly and easy to use environment.